David Bragger has filmed this superb 18-cut performance DVD of Berkeley's Eric and Suzy Thompson. The intimacy of the video puts you up close and personal. It's a bit like attending a concert and sitting a foot or two in front of the performers. The extensive liner notes also help you to get inside the tunes and songs. Not many musicians can play such a wide range of genres and maintain such a high level of excellence in each one, but Eric and Suzy are definitely up to the task. They open with the Mississippi Sheiks Stop and Listen with Suzy singing and playing fiddle and Eric on guitar. 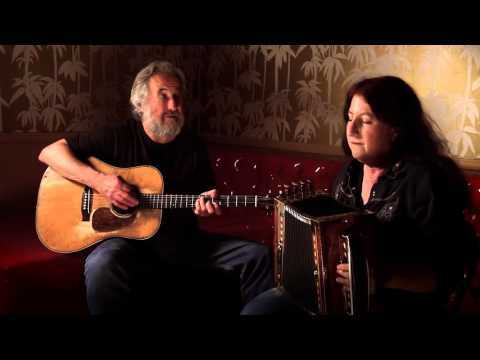 Suzy switches to Cajun accordion for Amédé Ardoin's Crowley Blues. Suzy goes back to fiddle for Babe from the East Texas Serenaders. They learned Cheese Read Waltz from Louisiana musician Wallace “Cheese” Read. Then it's off to Kentucky for a medley of Chinquapin Hunting from Art Stamper and Mike in the Wilderness from John Salyer. Aunt Caroline Dyer Blues is from the Memphis Jug Band. Suzy goes to guitar, and Eric to mandolin. Wade's Blues is from Cajun fiddler Wade Frugé. Boatsman is a lovely DDAD tune from North Carolina fiddler Marcus Martin. The very funky WSO Blues is from the Wise String Orchestra. Rainy Day is from the great Melvin Wine of West Virginia. You can hear the clouds open up as the rain pours down. Suzy goes back to accordion for the traditional The Old-Time Waltz. Crapaud (frog) is a two-step from Dennis McGee. Suzy wrote Forrest Rag in the key of F. Wayne Perry Waltz is from the Louisiana fiddler of that name recorded by Alan Lomax. You may recognize the melody as Drunkard's Hiccups, but Perry has Cajunized it. Burl Hammons of West Virginia is the source of Spring's All Muddy and the Pond's All Dry. Blues á Bébé is from Dewey Balfa and written by Joseph “Bébé" Carriere. Kitty Puss has been recorded by a few fiddlers; Suzy learned it from the Gypsy Gyppo String Band. Podunk Toddle comes from Freeny's Harmonizers from Mississippi. David Bragger’s Old Time Tiki Parlour has produced a variety of CDs, DVDs and CD/DVD combos over the past year, including his latest solo CD Big Fancy. He also writes the FolkWorks column, Old Time Oracle since January 2007.